Note that this form of the statement arises primarily out of the Book of Suffering the Bible. Ancient Greek philosophers all use the Silver rule again. How are these rules fundamentally different? The Golden Rule compels you to do things which you think are good, even if you're wrong about them. The Golden Rule further does not mention neutral things, which can lead one to believe that one must focus on "doing good" - no matter how misled one is about what's good. 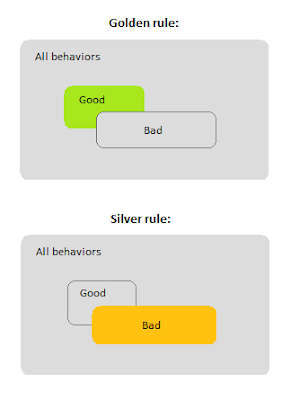 The Silver Rule, in contrast, compels you not to do things which are bad, even if you're wrong about them being bad. The Silver Rule leaves you free to do things which are either neutral or good. Whatever you prefer; just try not to do damage. The crucial difference is that people following the Silver Rule do less damage. They do less damage because they are compelled to avoid doing damage, rather than driven to do good. The problem with doing good is that the amount of good any single person can do is very limited compared to the amount of damage any one of us can cause. Only few people can contribute significantly to the scale of human achievement. But every single bumblehead can undermine the efforts of hundreds. The potential downside is so much larger than the upside, it is much more important for human beings to avoid doing bad, than to try doing good. In addition, following the Silver Rule leads to a happier life. If you merely avoid doing bad things, you are free to pursue all the other ones which are good or are neutral. On the other hand, if you are driven to do good things, you feel guilty when you're not doing them, even if you're hurting no one. So you're driven to do needless things you think are good, that may in fact be harmful. So please: follow the Silver Rule. Dump the "Golden" Rule. It is not for nothing that it comes from the Book of Suffering. "The greatest dangers to liberty lurk in the insidious encroachment by men of zeal, well meaning but without understanding." Compliments! Its truly enjoyable to read your articles. They short and clear. Thank you!